The FCRCC Premier Dragon Boat Program is the evolution of the very first dragon boat team in North America. Founded in 1985, the legacy has continued with numerous local, national and international accomplishments. The mission statement of our program is: “To prepare premier dragon boat paddlers for international racing success in a vibrant team environment.” To do this, we use several modes of training and are guided by two internationally successful coaches and a pool of seasoned world-class veterans. 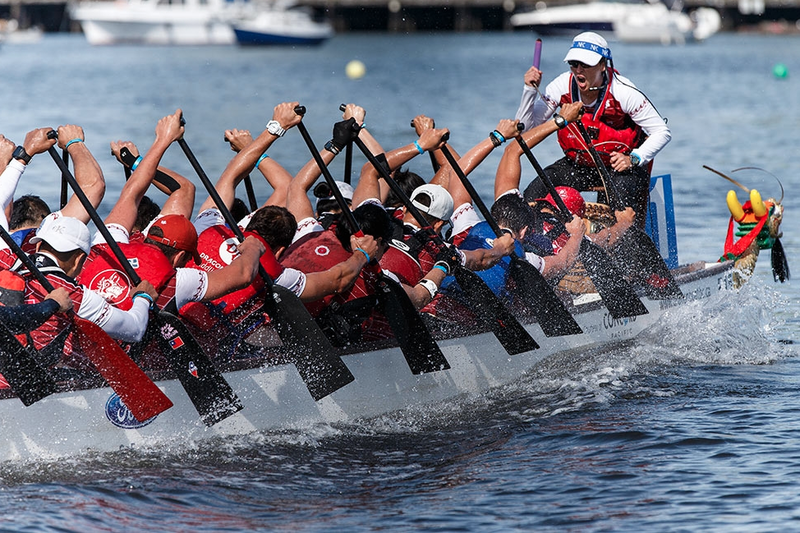 We train three times a week in dragon boat (Mon, Wed and Sun), twice a week in OC-6 (Tue and Sat) and one to three times a week in OC-1 (at various times). Please visit our website or contact us via our Contact Us page, if you would like more information. 2018-2019 membership are $325 ($200 for students) which lasts until October, 2019. Come out and try for two practices for free . A FCRCC membership is also required. Pro-rated membership rates are available for first-time club members. Information is at www.fcrcc.com. * club OC-1 orientation is required before using FCRCC OC-1’s (about 2 hours, offered periodically). ** huli recovery drills must have been done in the past. Sessions offered periodically at FCRCC. We can help you negotiate through these requirements. Please go to To Join page for more information.